Depicted here is a Boeing 777-300ER in Emirates’ livery. 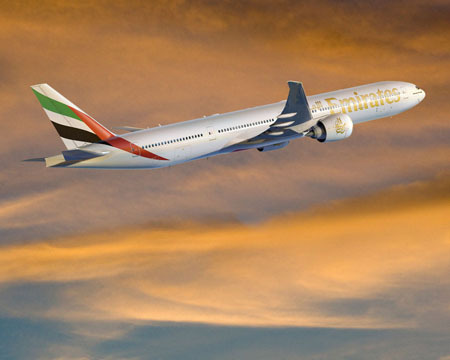 FARNBOROUGH, United Kingdom, July 19 /PRNewswire-FirstCall/ -- Boeing (NYSE: BA) and Dubai-based Emirates Airlines today announced an order for 30 Boeing 777-300ERs (Extended Range) at the 2010 Farnborough International Airshow. Eighteen of these were previously attributed to an unidentified customer on Boeing's Orders and Deliveries website. Emirates is already the world's largest 777 operator with a fleet of 86 777s through direct purchase and lease, plus an additional 16 777-300ERs previously on order. It is also the only airline in the world to operate every model in the Boeing 777 family, including the 777 Freighter. "Since we took delivery of our first 777 14 years ago, the airplane's reliability, performance and operating economics have firmly established it as the backbone of our fleet," said His Highness Sheikh Ahmed bin Saeed Al Maktoum, chairman and chief executive, Emirates Airline and Group. "Our decision to further expand our 777 fleet reflects our plans to continue to build our fleet of the future and grow our expansive global network, which already spans six continents. It also demonstrates our commitment to operating a modern fleet that not only enhances the passenger experience but our operational efficiency as well." Emirates took delivery of its first Boeing 777, a 777-200, in 1996, and since then the airline has deployed the 777 on short-, medium- and long-haul routes. "Emirates is today one of the world's leading airlines. Its growth over the years has established it as a truly global force in the aviation industry," said Jim Albaugh, president and CEO of Boeing Commercial Airplanes. "Emirates has played an important role in the success of the 777 with its strong support and valuable feedback over the years. Today's order underscores the airline's confidence in the airplane which forms the backbone of its fleet. For that we are very grateful."